I was once asked to give an informal presentation about Luxembourg in Japan. I titled it “Luxembourg, the land of Fortifications, Fe, Finance, and Forests”, where Fe is the chemical symbol for iron. These four “F”s are certainly geographic and historical aspects of the country that stand out. 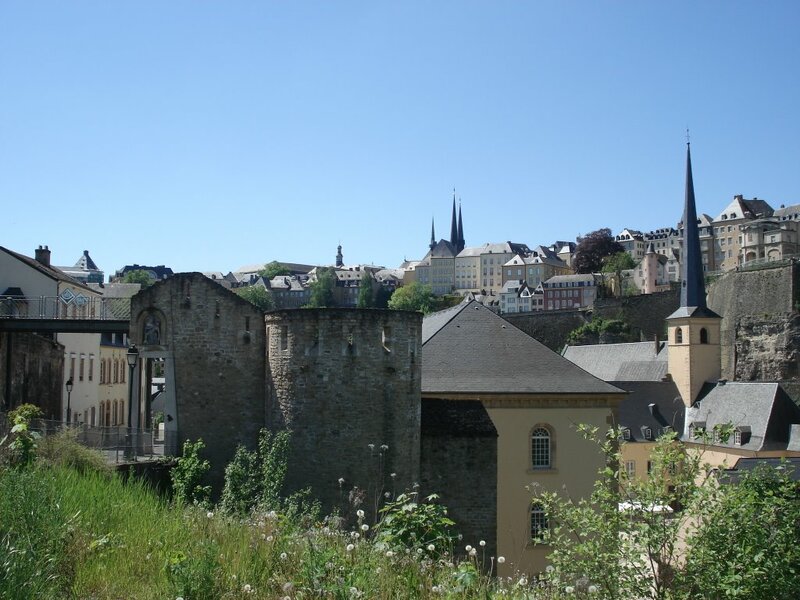 In that talk, I remember going much too deep into the history of Luxembourg, from the origins of the fort “Lucilinburhuc” acquired by Count Siegfried I to a the country becoming a founding member of the unification of Europe. Luxembourg has had a tumultuous history with the rise and fall of the House of Luxembourg, repeated annexation, partitioning, and fortification of the fortress in the capital by the powerhouses of Europe, whilst, shrinking in size as a country throughout the centuries after every war. I sometimes think it is a wonder that Luxembourg still exists at all. With the discovery of iron ore in the south of the country in 1842, the joining of a customs treaty with Germany, and with the help of a large flux of Italian immigrants, Luxembourg developed into one of the most important steel industries in Europe, which flourished into the 1970s. Then it collapsed with the global oil crisis, and Luxembourg transitioned to a banking based economy, which is still its largest economic sector. By concentrating so much on the fascinating history, I ended up not having much time in my talk to describe the many wonderful culinary delicacies, modern lifestyles, and current events in Luxembourg. I am particularly fond of Luxembourg food. Although Luxembourg national dishes have mainly peasant origins, I find they are somewhat better spiced and more refined than their German counterparts. I would even go as far as saying the taste is French, just the portions are German. Judd mat Gaardebounen, Bouneschlupp, Fritür from the river Moselle, Hong am Rèisleck, and, my favourite, Huesenziwwi (hare) are some of the delicacies you should try if you have the chance. For dessert, have a Quetschentaart, a plum tart. For breakfast, have some of the most delicious bread in the world − Luxembourg bread is also more French than German − with Kachkeis (the traditional national cheese), or some succulent salami or ham. As a half Luxembourg half Japanese person, I probably only know half as much (or less) of Luxembourg compared to the ordinary Luxembourger, since I’ve only spent the first seven years of my life there. But since then, returning every year for Christmas and for summer has imbued me with many warm memories and impressions that I never forget. They impel me even now to go on drives into the countryside with my aunt or by myself, exploring the rolling hills dotted with grazing cows, the golden vineyards along the Moselle, the deep green forests, and the many tranquil castles and ruins around the country. In fact, living outside of Luxembourg, but visiting regularly, has made me appreciate Luxembourg more than ever. There really is a lot to this little country, and future posts will describe individual experiences and various aspects of Luxembourg in more vivid detail. For now, I would like to take this opportunity to warmly welcome you to LIEF and invite anyone who has questions or comments about Luxembourg, or wishes to learn more about the country to make use of the interactive elements of this site. We hope this forum will prove to be of ever greater value to you as the number of members and the contents increase, whatever your current or future connections with Luxembourg may be. Some day soon, it will hopefully become the first point of call for anyone in Japan or Luxembourg wanting to know, discuss, or ask something about life, work, business, or leisure in Luxembourg.